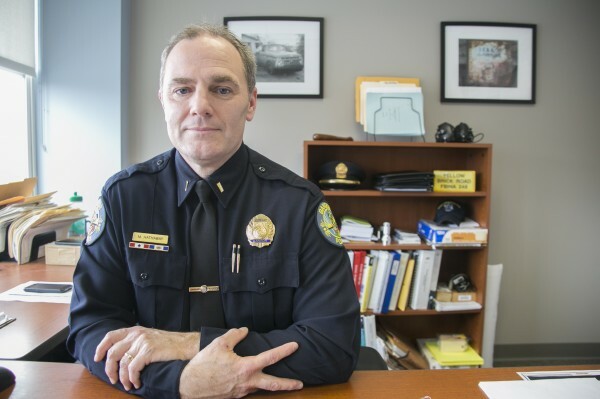 BANGOR, Maine — It doesn’t matter if you’re in the state’s biggest city or the Queen City — illegal drug use is behind many of the violent and property crimes residents experience, police department leaders in the two communities said Friday. Even though Bangor saw seven homicides in 2012 — five that had some sort of drug involvement — all have led to charges or have been cleared, he said, and the number of violent crimes in the city actually dropped to 67, compared to 69 recorded the previous year. At the same time, however, property crimes in Bangor, including burglary, thefts and motor vehicle thefts, all increased. Bangor, with a population of about 33,000, saw 32,870 calls for service in 2012, and Portland, with a population of about 64,000, responded to 83,885 calls for help for everything from a suspicious person to a business alarm. Bangor police arrested or charged 2,854 people last year and Portland police placed 5,843 people behind bars or ticketed them. Based on the data, “We have 155 percent more work calls compared to Bangor,” Portland police Crime Analyst Lisa Reagan said recently. The state’s biggest city may see a lot more crime, but their clearance rate, which averaged 18.34 percent between 2002 and 2011, is historically lower than that of Bangor, with 28.85 percent of the crimes they respond to solved in the same time period. The increasing number of pharmacy robberies between 2008 and 2012 is a sign of Maine ’ s addiction to diverted prescription pills. The state saw a record number of pharmacy robberies in 2012 at 56, up from just two that were reported five years ago. Both Bangor and Portland saw pharmacy robberies last year, with the Queen City tallying six, with the Rite Aid on Fourteenth Street being hit four times, and the Forest City seeing three that all occurred before mid-March. Residents of the two cities like to abuse diverted prescription drugs, but they have slightly different tastes when it comes to other illegal hard drugs. It’s a deadly shift, he said. Malloch issued a warning to heroin users in February saying 13 people in Portland had overdosed on the drug, and two had died, since Dec. 1, 2012. Bangor police officers may see heroin, cocaine and crack, but synthetic bath salts are apparently the drug of choice for many in the Queen City, Sgt. Paul Edwards said. Bangor saw 237 drug-related calls in 2011 and 154 in 2010, Gastia said last year. He said that between 80 and 85 percent of crimes Bangor responds to are due to mental illness and/or substance abuse. The former police chief said bath salts were behind the increase in violent crimes, which rose from 51 incidents in 2010 to 69 in 2011. To track crime statistics, Bangor and 133 other municipal, county and state law enforcement agencies in Maine — along with others around the country — provide data each year for the Federal Bureau of Investigation’s Uniform Crime Reporting Program. Crime in Maine decreased by 1.5 percent during 2012, for the first time since 2009, but some drug-related categories skyrocketed, according to a report released in May by the Maine Department of Public Safety’s UCR division, which collects and analyzes the statewide data. Pharmacy robberies and the number of babies born in Maine exposed to drugs, which jumped from 165 in 2005 to 779 in 2012, increased tremendously, and the state also saw increases in robberies, which rose by 13.8 percent, and domestic violence, which increased by 4.5 percent. “Drugs remain a key reason for much of the crime in Maine,” Public Safety Commissioner John E. Morris said in the May press release. The number of robberies in Bangor between 1991 and 2008 averaged 19 a year and never exceeded 25 in those 18 years, but in 2009 jumped dramatically to 35. The following year the number dropped to 30, but resurged in 2011 to 35 and increased again in 2012 to 40. At the same time, the number of aggravated assaults reached a record low for the last 21 years at 13. For Portland, aggravated assaults is the only violent crime category to go up, increasing from 73 in 2011 to 79 in 2012. There were 26 homicides statewide in 2012, compared to 28 homicides in 2011, and a quarter of them occurred in Bangor. Portland recorded just one. Five people have been charged in the seven Queen City homicides. Possibly the most shocking of those was the Aug. 13 drug-related triple homicide that left three local people burned beyond recognition in a Rhode Island rental car. Police arrested and charged two out-of-state men with murder and arson a little over a month later. The last homicide for 2012 involved a self-defense stabbing on Elm Street, investigators determined. Bangor saw two homicides in 2009, three in 2010 and one for each of the three years prior, 2007, 2008 and 2009. Portland had two homicides in 2011, six in 2010, and four each for 2009 and 2008. Violent crimes in Portland, which have averaged around 255 incidents between 2003 and 2010, dropped to 200 in 2011 and decreased again to 192 in 2012. Property crimes for the Forest City also decreased from 2,622 in 2011 to 2,578 for 2012. Malloch attributed the decreases in violent and property crime to the start of CompStat, or computer statistics analysis, that basically is a communication and monitoring system that identifies and creates steps to address emerging crime trends. He said the program gets everyone at the table talking about what is happening and working towards solutions. Craig departed in August 2011 for Ohio and last month was named chief of the Detroit Police Department. Michael Sauschuck was sworn in to replace him as the Forest City’s 19th police chief in February 2012. Improving the quality of life in Bangor is one of Hathaway’s missions as the new police chief.